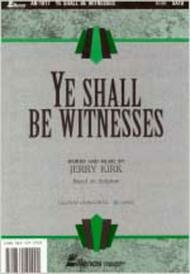 Ye Shall Be Witnesses - Kirk (Anthem) composed by Jerry Kirk. For SATB choir. Anthems. Traditional and Sacred. Octavo. 8 pages. Published by Lillenas Publishing Company (LP.AN-1017).ISBN 9780834192904. Traditional and Sacred.A fabulous setting of this choral standard. Majestic! Dramatic! Powerful! Expressive! The arrangement is a work of art.